Learn basic blacksmithing techniques in the process of making a hook rack. Students will choose one hook design and practice forging techniques while making multiple hooks. 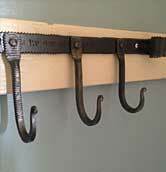 The hooks will then be riveted onto a forged mounting bar, completing the project. This will be an intensive and very fun weekend of forging.